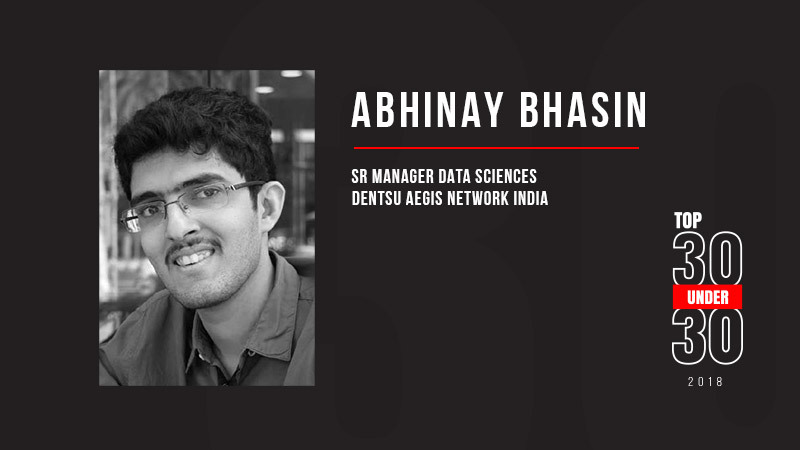 Abhinay Bhasin, Associate Director Data Sciences at Dentsu Aegis Network gets candid on his favourite campaigns, perception of the industry and a peek in his #AgencyLife. Devotion to Duty Determines your Destiny – mantra that not only Abhinay Bhasin believes in but also keeps him going. From an internship at Deloitte to Associate Director Data Sciences at Dentsu Aegis Network, Abhinay Bhasin tells Social Samosa what helped him make it to the #30Under30 list. In his opinion, reading voraciously, keeping up with different lines of the business through personal interaction, and daily physical activity can help one go a long way. Excerpts below. As a postgraduate in Economics, understanding consumer behavior is an innate passion for me. With the volume of consumer data available in the digital marketing domain, owing to its real-time behavior driven nature, I was naturally inclined towards understanding the depths of this ecosystem and to make sense of the vast array of data available from a plethora of intent-driven platforms, to feel the pulse of the modern consumer. Having been entrusted with the responsibility of developing in-house data-driven capabilities within the Dentsu Aegis Network in the South Asia region, the journey so far has been extremely rewarding. In the short span of 18 months, my team and I have been able to create Dentsu Aegis proprietary insights, planning and optimization tools on digital that has been globally recognized through the efficiency in campaign optimization in 14 large markets of the network and has won several awards with unmatched capabilities. One of the greatest rewards of being one of the founding employees, and now risen to be Associate Director, of the Dentsu Aegis Network Data Sciences Division in India, is the fact that for the first time in the history of the industry, we have been able to establish India as an exporter of tools, technology, and marketing sophistication. Through our deep integration with Facebook and Google, we have partnered with their teams in San Francisco to have beta tests of unique products built in India first and then exported to the rest of the world. The use of the DAN (Dentsu Aegis Network) India proprietary tools, built completely in-house by the data sciences team, in 35 large markets, with 14 of them (including Japan, Australia, Germany to name a few) having integrated them as a part of their daily workflows, has been one of the greatest rewards thus far. Your idea of an ideal campaign? One of the tenets of marketing is to deliver the right message to the right person in the right moment on the right platform. An ideal campaign, in my mind, is one that has a simple message and is able to strike the right chords in the heart of the consumer. It’s not always about thumping one’s chest with boastful brand SOVs, but about delivering that message in the right manner to inspire change, solve a problem for the consumer and as a byproduct – result in sales. A classic example of this is the approach Nestle took in India when its beloved product “Maggi” was taken off shelves in June of 2015. While consumers launched a “We Miss Maggi” social media campaign of their own accord, in response to their beloved product removed from shelves overnight due to tests that proved a high quantity of lead in the product, the brand decided to run a “#WeMissYouToo” campaign featuring monologues by young citizens who are addressing their beloved brand, rife with affectionate endearments to an old buddy. The brand did well to quickly receive 10 million hits on its campaign, validating the fact that consumers remained solidly behind the brand after its touching messaging. Today, 2 years on, brand trust levels are back to 90% and for good reason. A memorable campaign I worked on in my erstwhile role, as Media Manager – Carat on the Mondelez business, was on the integration of 5 Star with the Rajinikanth blockbuster “Kabali”. The campaign helped the brand strengthen its stronghold in the south while boosting brand sales in the same month. My family motto, instilled in my sister Abhilasha and me from birth – “Devotion to Duty Determines your Destiny” is something that keeps us going. Begins with an early morning run on Marine Drive. This is followed by a good breakfast while I read the morning news, 5-6 articles of interest and clear my emails from the previous night (given my involvement in projects that lie in different time zones). I then head out to work where the grind begins with a team huddle to align our efforts for the day. Whilst catching up on the normal work routine of ongoing projects that involve some research and a few calls with international markets on current projects, I ensure I spend at least 15-20 minutes in the day having a conversation with a colleague in a different line of business, to understand his/her role, challenges and explore a data-driven solution. Once the day is done, I look forward to reaching home and spend a good half hour with my two-year-old pet Cocker spaniel – Simba – which I’d say is my best moment before a nice family dinner to seal the day. One thing which I feel helps me stand out, which I encourage upcoming participants to adopt, is to always look out for trends on the rise. Look at how you can solve your client’s problem by adopting innovation. Then be bold enough to venture into an unchartered territory and conquer it. One stereotype about working in the digital media sector that is thrown at you every time….